I live in the Garden State. Yes that’s right, New Jersey. The state known for it’s closeness to NYC, it’s stinky highways, industrial areas, and also it’s beaches. What most people don’t know is that we do have plenty of greenery here, as the name suggests. Folks really love to grow their veggies in our neck of the woods and when summer rolls around, we have cucumbers for dayyys. 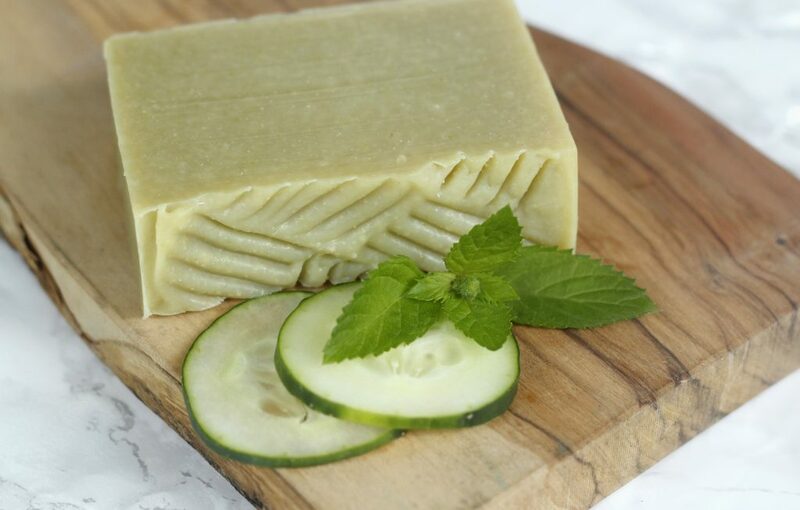 Which, of course, is a more than enough reason for me to make some cucumber soap. And this one is a full on cucumber soap in that I replaced the ENTIRE water content with cucumber juice (seeds, peels and everything). To stay with the summery theme, I scented it with a fresh, invigorating mix of spearmint and peppermint essential oil. Oh my! 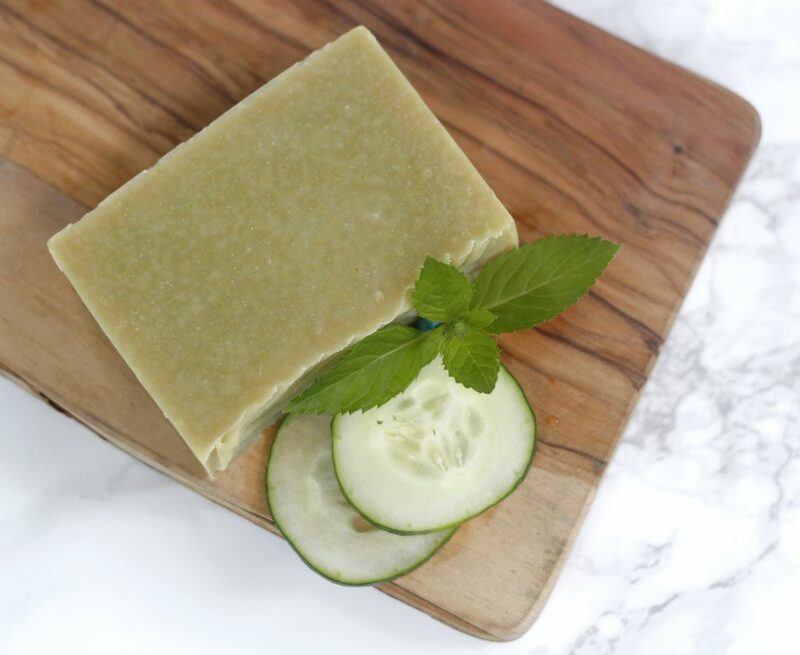 Let’s take a look at this cucumber mint soap recipe, shall we? 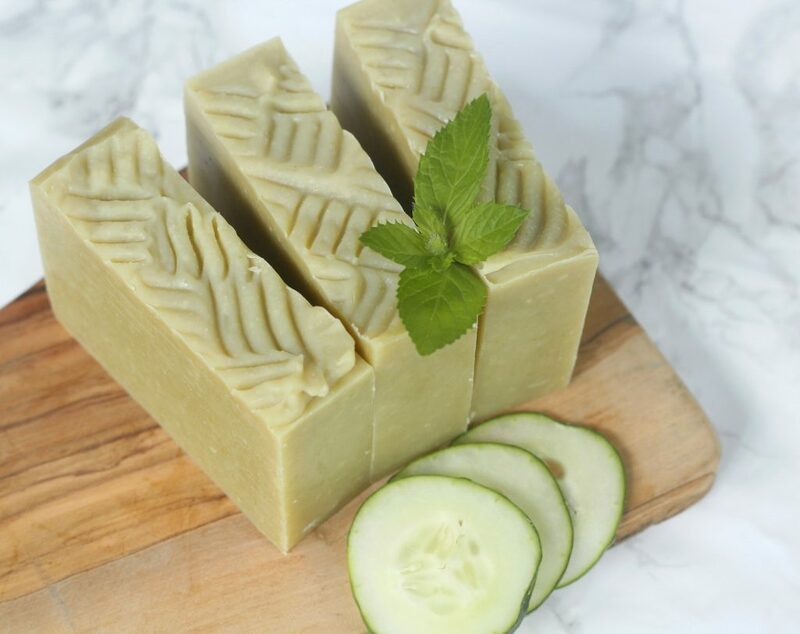 This recipe will yield around 42 oz of cucumber mint soap (8 average sized bars), you can resize the recipe to your heart’s desire using a lye calculator. It is always a good idea to run every recipe you find online (including this one) through a lye calculator, just to be safe. 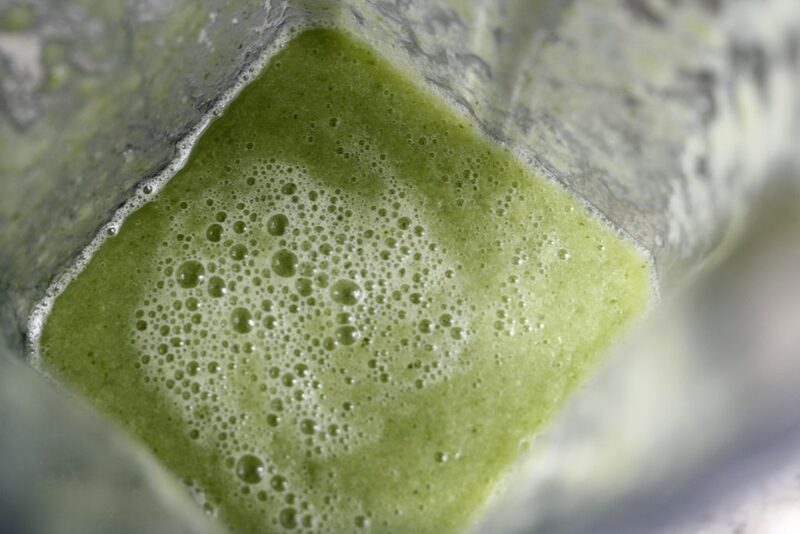 This recipe uses a superfat of 6% and a 35% lye concentration. Cut the cucumber into small chunks and add the peel of another cucumber (optional, this will give you a deeper hue with little green specks), blend until everything turns into a smooth liquid. If you end up not having enough cucumber juice or your liquid seems too thick add a little distilled water. Put cucumber juice in the freezer until it forms a slushy, but isn’t frozen solid yet. Slowly and carefully add lye to the cucumber slushy, stir until lye is completely dissolved. Place the container with lye solution in an ice bath. This is important since the cucumber juice can cause the lye to heat up A LOT and you want to prevent it from scorching. When lye solution and oils are both below 100 Degrees F, slowly pour lye solution down the shaft of your stick blender into the oils. Burp (gently tap) your stick blender to release any air bubbles and stick blend your soap until it reaches a light pudding consistency. By now the soap is likely to be at thick trace (thick pudding consistency) and you can get creative texturing the top. I used a plastic fork to create sort of a checkerboard look. If you wish to gel your soap (I did) wrap a thin towel around it and keep an eye on it for the first hour. If you see a crack forming on top, the soap is getting too hot and you need to take the towel off. 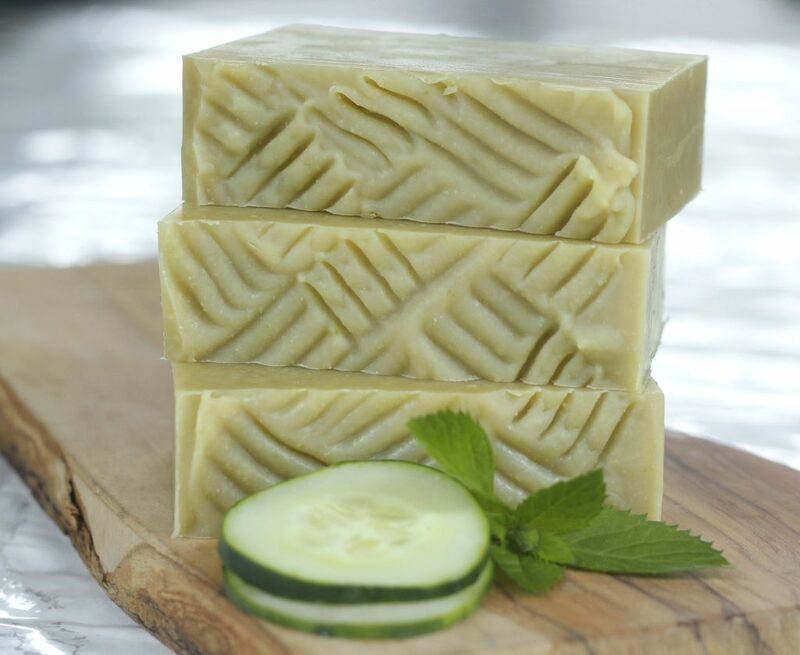 Unmold after 24 – 36 hours, cut cucumber mint soap into bars and cure for 4 weeks. 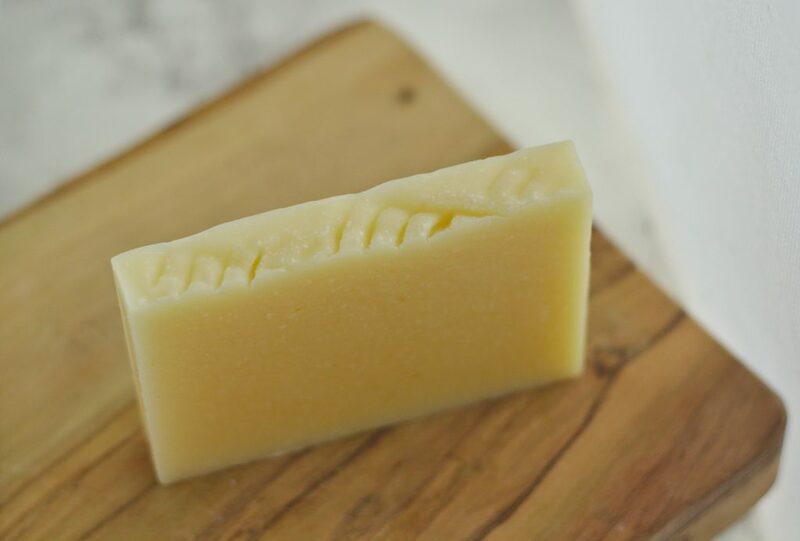 We all know that cold process soap can change over time: the colors may fade or even worse the scent may become different or disappear all together (gasp!). That’s why I like to show you how the soaps that I make here look like after some time has passed. Is there any substitute for tallow? I can’t find it where I live. you could substitute with lard or sustainable palm oil. 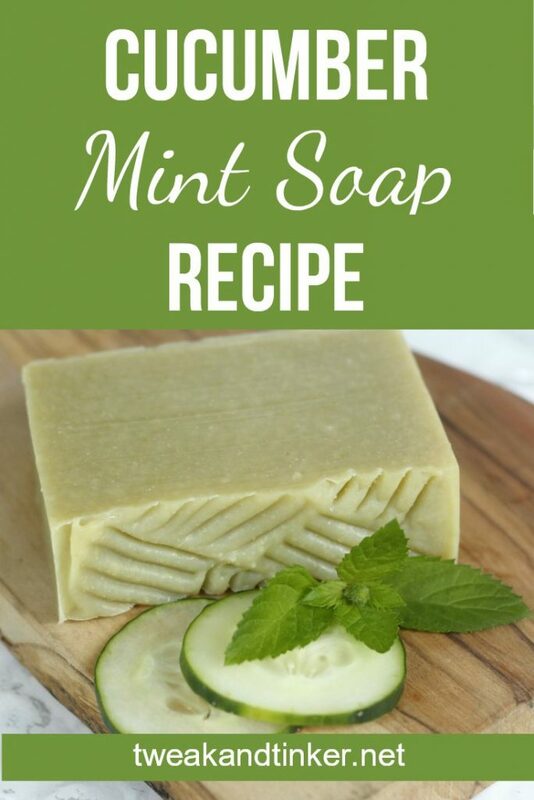 Be sure to run you recipe through a lye calculator (I use SoapCalc ) after doing any changes to a soap recipe as the amount of lye will likely change. I hope that helps, happy tinkering! I noticed you have more lye than water, wouldn’t that make a lye heavy soap? thank you for your question. The water in this recipe is fully replaced by the cucumber juice. So, we have 7.7 oz (218g) cucumber juice and 4.1 oz (117g) of lye which brings us to a lye concentration of 35 %. Will it have any bad reaction with the cucumber? Hi Simy, I imagine that you can do that. I don’t see why it would have a bad reaction, but I personally haven’t tried it with this recipe.